Beverley Ditsie is an activist and filmmaker whose work features at Queer Lisboa in 2014. Michael Langan talks to her about the rules of gender, sexual politics in South Africa and why always being yourself is the best form of activism there is. Beverley Ditsie is a woman with an extraordinary history. 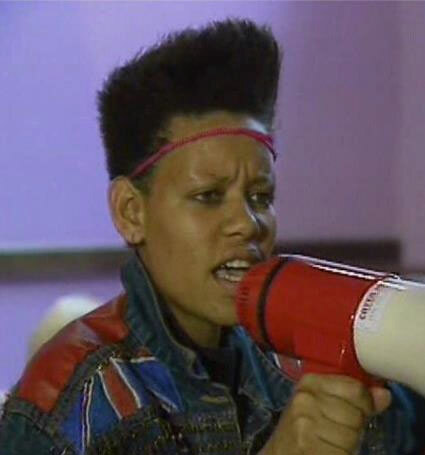 Activist, filmmaker, musician, actor, television producer, she was at the forefront of LGBT rights in South Africa and beyond through the whole of the 1990s. She was instrumental in founding the gay rights organisation GLOW, creating and contributing to public conversations regarding gay rights, women’s rights, human rights, influencing policy and raising awareness. 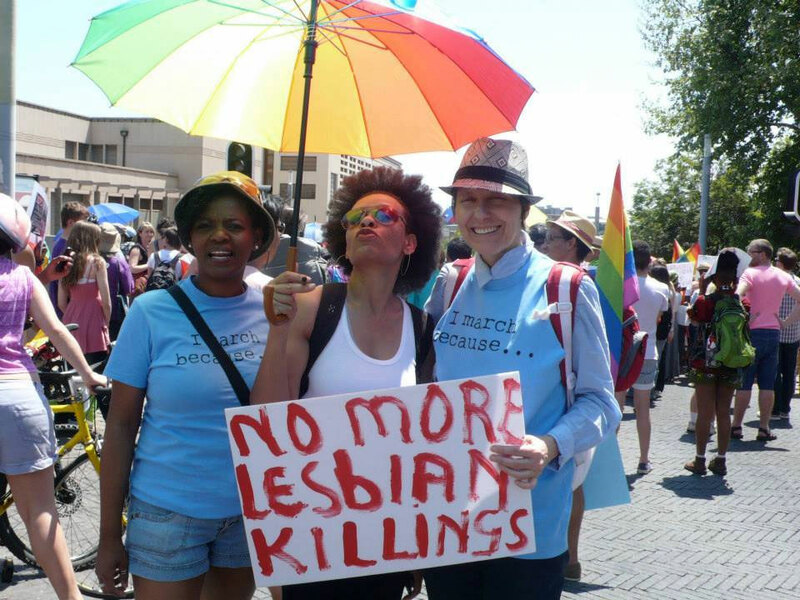 She was amongst those arguing for the inclusion of discrimination against sexual orientation in the new South African constitution, the first in the world to make prejudice against people based on the sexual orientation unconstitutional, and was one of the organisers of South Africa’s first Gay Pride March. 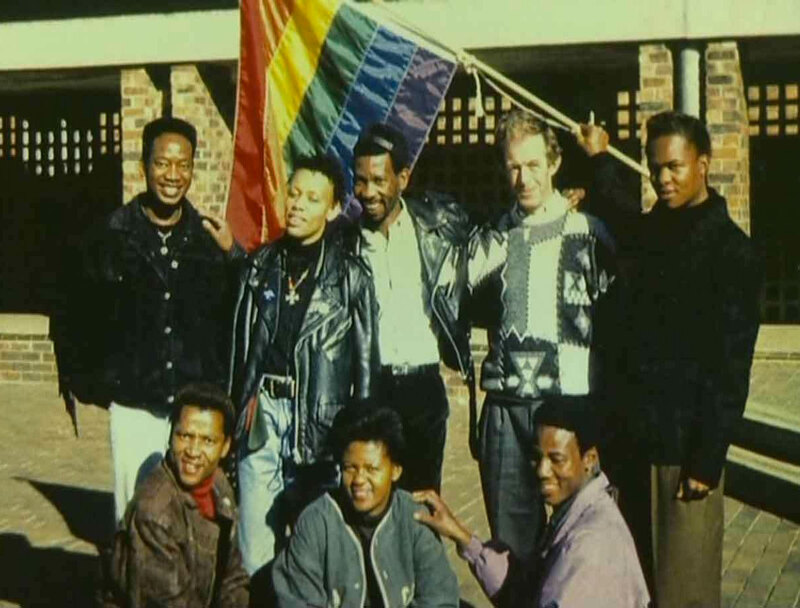 In 2002, Beverley Ditsie (with Nicky Newman) made a film, Simon & I, about her relationship with Simon Nkoli, the leader of the gay rights movement in South Africa. Nkoli had been in prison with many of the anti-apartheid activists who went on to form the first ANC government and, as an activist, Beverley was his de facto deputy. She felt he was her teacher and mentor, but, as her star began to rise, they fell out, not speaking for some years before eventually becoming reconciled. Nkoli died of an AIDS-related illness in 1998. 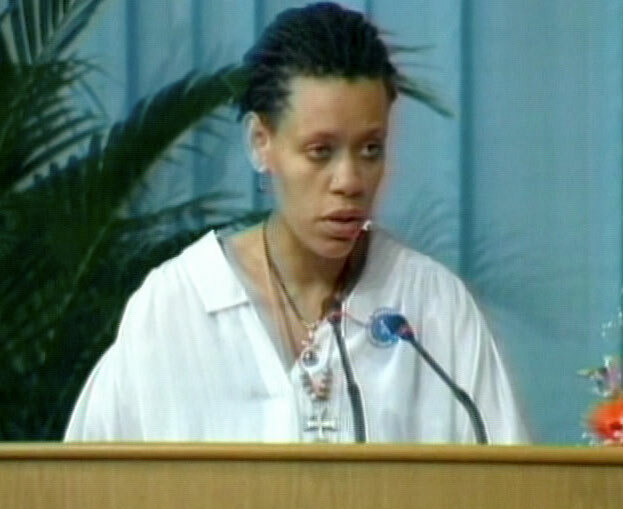 The film tells the remarkable story of that time in history, but it’s also a deeply personal autobiography of Ditsie’s life and experiences, which include her childhood experience of believing herself to be a boy, being the first gay African woman to address a UN conference, and her participation in Big Brother in South Africa, in which she was subjected to bigotry and prejudice from the other housemates. 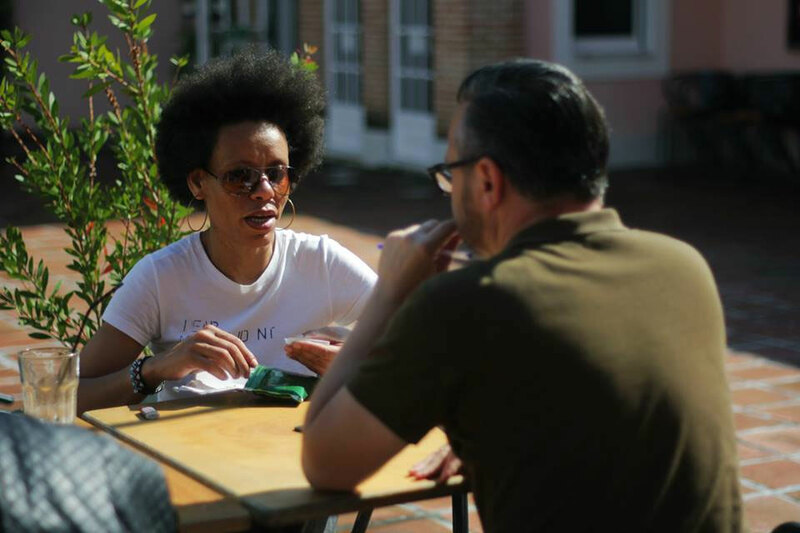 I interviewed Beverley at the Queer Lisboa festival, during a week of Queer African Cinema, debates around queer identities, representations, and queer experiences in African countries, and the showing of Simon & I, which, for many reasons, she finds too difficult to watch herself. She’s an extremely engaging, articulate, and charismatic figure, which explains why she was so good as an activist, though these days she’s finding new and different ways to carry out that role, ways that are more fulfilling for her. Tell me about your life as kid. When did you decide you were a boy? Oh, I didn’t decide, I knew I was a boy. That’s a whole different notion. It was only later on, when I saw how boys were formed, that I realised I wasn’t a boy, and that was hard for me. I grew up in a maternal household with my mum, my gran, lots of aunts and, eventually, my baby sister, so I didn’t even know how I was supposed to look in order to be the way that I felt. It never occurred to me that I was a girl until I got to puberty and men were hitting on me, and my life became miserable because I didn’t understand why that was happening. And, interestingly, it was perfectly okay until I needed to really identify what I was and where I belonged. That for me became the difficulty because once I had found the European words – they came to me from Boy George, incidentally – then translated them and took them home to my family, I became an abomination. I was fine as the ‘boy’ in the household, as this anomaly, the loveable me who fixed everything in the house and played with the other boys in the streets. I was just as shocked that they were shocked because, in my happiness at finding words that identified who I am and gave me some sense of belonging, even though I didn’t know anyone at the time who was like me, I knew that all I had to do was go to find them. Until I identified myself in terms of my sexuality my gran just hoped I was going to grow out of this tomboy business and become a teenage girl who discovers boys and that would become the problem. But my problem was the misery I felt at discovering what I was but that I had no community. So the loneliness of it was quite deep, until the community actually happened. Did you still feel loved? No one’s ever asked me that before. I’ve done countless interviews and no one’s ever asked me that before. Look, it begins with the self, right? Just the finding of the words and using them, while hearing and knowing that biblically and traditionally this was an abomination, meant that my own self-love went downhill. I’m deeply spiritual, always have been, and I don’t know any gay person who hasn’t asked themselves, ‘Was I made by God or the Devil?’ To think that I might be sinning against my Maker, who I adore, was hard because then the question was, ‘God, how could you do this to me?’ So the self-loathing began in me before it translated to those out there. Of course I was loved, though I might not have felt it for the longest time simply because there was conflict and tension in the household. No one could understand why I would make the decision I was perceived to be making, when in fact that decision was to be as much me as possible, and not anything else. In whatever way love is expressed for you – in making food for you, by making sure your school shoes are okay, and that you are okay – love was expressed. I could have been kicked out, but I wasn’t. …Or an effeminate gay man. Gender roles are very strictly enforced in South Africa. Even though we’re all urbanised and we’re born in cities we all identify with whatever tradition or culture we come from, to a large degree. Even if you don’t you’ll be forced to acknowledge it by those around you. The violence you’ve described towards lesbians seems to be the most extreme kind of violence currently perpetrated. And we need to keep having these conversations because power will always try to re-establish itself and I feel we’re really talking about circulations of power, in lots of intersecting ways. Watching you in Simon & I you seem so fearless, so powerful, and you probably didn’t feel like that a lot of the time. Maybe you were performing fearlessness? Ah, the joys of youth! I was untouchable. Yes, I was terrified, but the terror fuelled my anger and it was the anger that then drove what looked like fearlessness, pure anger that one could be treated so badly for absolutely no reason. My sexuality has absolutely nothing to do with anything whatsoever, so how does it affect someone else’s everyday life? …yes. But, also, a lot of the new channels of communication allow for anonymity and you can be homophobic under that cloak. I think of new technologies and social media as being able to facilitate a lot of regressive attitudes. Yes, across the board. Whether it’s the homophobia, the misogyny, the racism, or the xenophobia, I think the world is regressing. I know I’m generalising but I’ve been to enough countries in the world to know that, once where you thought you were a little freer, not so any more. It’s as if one generation comes up and experiences the need for, and the feeling of, freedom, and the next generation feels the need to reassert roles and prejudices. How that happens is still beyond me. How do we combat this? What are the possible strategies? You do realise that’s a very deeply philosophical question? I mean, the state of the world, the shifting of energies, spiritually, physically, in terms of global warming, migration, population explosion – which could be one of the major factors because people feel their space is getting encroached upon – food supply, water is being bought and is now very expensive. I don’t think you can isolate one thing from all the others. In these shifts we might need one particular threat in order to come together, as humanity, to have a singular vision. If you look at history there’s always a major catastrophe before a new renaissance and the more comfortable people get it gives rise to new repressions, new forms of fascism and controls. How do you deal with it? At the moment I don’t know. Everyone’s looking out for themselves, for their immediate families. We’re not a global community, or one humanity. If we were we wouldn’t be treating each other the way that we are. Palestine would not be what it is. Apartheid would not have happened. Women would not be treated the way they are in Afghanistan, in Pakistan, in certain countries in Africa. It’s true that some places are better than others in terms of how I am treated as a black woman, but the fact is there are places I simply refuse to go, because I’m not going to change the way I dress, or the way I am. …but you can change what form that activism takes. It was very important in the film Simon & I, and in the way Simon himself became an embodiment of an issue, that he became a story. Absolutely. I don’t think there is any single place I go to where my presence alone is not a threat and the more remote the place the bigger the revolution caused by my presence. One of the things Simon taught me is that, if you personalise, and it’s human to human, and it comes with humour and education, that’s a great strategy for an activist. One might say I have stepped back, but I have only stepped back from the microphone. I haven’t stopped being an activist. Activism means constantly asking, ‘Why?’ Seeing all kinds of abuses and saying, ‘Why?’ I’ve asked that since I was a child. I couldn’t understand why men were treated differently to women and I constantly asked, ‘Why?’ My family is split into many different cultures, all parts of who I am. Some of them expect levels of deference towards men that are quite extreme, women showing respect by lying on the floor, serving tea on your knees. Being asked to do that whenever some family member came to visit, seeing my mum greeting a twelve-year-old boy with total deference. At the same age as that boy I was asking my mum, ‘What the hell is that about! ?’ Everything that she’d gone through as a woman – making sure the household was still standing when there were no men around, the life she had lead to be who she was – and to be almost on your knees to a twelve-year-old boy, because tradition dictates! That ‘Why’ always stays with my and will never go away. These days it’s rare not to be accepted in a workplace, but if there is a challenge my reaction is to treat that person as if they are the most ridiculous person on the planet to the extent that they start to question their own attitudes. This is also a form of activism; to be so You that it’s not easy to be challenged. …That’s one scene that I can’t watch. I don’t even know what I say to him in response because I’ve never watched it. If I’m forced to sit through it, I’ll put my fingers in my ears and shut my eyes tight because it’s not me to explode like that. Was it a form of activism for you to put yourself in that situation? Totally. It was 1994-95, right after Mandela became President. It really was a social experiment to see if and how the different races could live together. You work in television, you know how it works. They’re not going to put people together who they think will love each other. It’s not interesting. …the guy who describes your sexuality as ‘mentally retarded’? Did it work as a piece of activism? Did it create conversations? I think to a large degree it worked. It was very interesting from a black perspective. People admired me a lot more for standing up against the racism in the house. My sexuality became a side issue. It was perfect timing for that kind of show because people were seeing me as me, not as my sexuality. You mention in the film Simon’s role in your life as teacher and mentor. And I thought that he was also like an elder brother to you, perhaps even a father figure. As you became more visible and more vocal, more confident also, the tensions in your relationship seemed about a shifting power dynamic. Oh, it was completely about power. That must have been hard to cope with. I wanted him to be proud of me for how I was learning from him. I am a bit naïve like that – I don’t see power play until it’s right there and then it hurts. I expect people to approach things with faith and trust and honesty but I often find myself at the losing end of that. Being Simon’s female counterpart in the activist world was okay up until the point I became a star myself. I can’t presume to know what was going on in his mind and how it translated into his actions, but to a degree he was also my boss. Did you never have a conversation with him about it? Never. We never had a conversation about it. As much as we might want to run away from how culturally defined we are, the fact is there are certain things you do not discuss with people you perceive as your elders. His inviting me to GLOW’s 10th birthday party was an apology, a truce, even though it was not stated. It would be an interesting conversation were he alive today to ask him – it would be the conversation of my life, because I gave 10 years of my very being of the movement. I was angry when I left, when I divorced myself from it, there was so much power playing going on with new, international organisations getting involved and all the rest of it. That’s when I realised there is a big difference between being an activist and a politician. Simon was invited into Parliament by those he’d been in prison with and absolutely refused, and I myself was invited to become a Member of Parliament, and I too refused. It didn’t make any sense to me because it meant playing politics, backstabbing people and lying. That’s not me. …I didn’t know until I’d walked out and there was all this press attention and cameras clicking and the woman next to me told me I was the first African lesbian to address the UN on the issue of Women’s rights. I didn’t know. I was just doing what I normally do. It was very simple. When deciding who was going to speak I just looked at everyone and said, ‘You’re all European here. If you are going to address these issues with all these African countries sitting here it’s just another European point of view imposing itself.’ I didn’t need to say anything else before the penny dropped. Our President, President Mandela, had explicitly said, ‘Gay Rights is an issue of Human Rights and you will be protected under the Constitution of South Africa’, and it was unheard of. Do you think there’s still a hierarchy of rights? I remember going to ANC youth conferences, before Mandela was released, and there would be a category called ‘Women’s Issues’ and it would be the last thing on the agenda. Everything else needed to be discussed before we could approach it, but by the time we got to it everyone was leaving, and we’d been there all day so the only people left in the room were the converted. The hierarchy is still there. The men make the decisions on the shape of the world, even though the world is run by women in our everyday lives. There is not a single forum I have been in where the things that are pertinent to me have been properly addressed. Even within the LGBT movement I would find ‘Lesbian Issues’ at the bottom of the agenda. The hierarchy still exists. I’m sure people who are transgender, or intersex, feel the same way. You know, you don’t have a page on Wikipedia. You are mentioned on Simon’s page, in relation to having made the film, and it struck me that you should be there, that there’s a gap in the history of LGBT rights. Do you care about that? From an egotistical and narcissistic point of view, no, but from the point of view of history, it matters, because a lot of information about me on the net is out of date, or very limited. Considering how much I document everything, well, I didn’t even know that I’m not on Wikipedia. I think it’s particularly important for women, and for black women especially, to know that you were so instrumental and so central in the conversation and in what happened. It really needs to be addressed, I think, because who decides who gets written about? It’s a shocking absence. The same thing can be seen with the research I do for the TV programmes I’m working on now, which are highlighting South African musicians from the period between 1960-80s who don’t get acknowledged because it was the height of repression at that time. I knew them all through my mum, who was a musician, but when I Google them, they don’t exist. In relation to queer cinema, where are the black made films about the struggle, about Mandela? There are things on TV now, but where is that blockbuster? We have got a long way to go to tell our stories, still, to make sure we are represented. And you have to tell your story too – it’s too important for people not to know about it. I never saw myself as any kind of big deal in any way. I just did what needed to be done. There was Simon, a man, saying, ‘I’m black, I’m gay’ and I thought, I’m black and I’m gay, but where are the women, speaking on my behalf? There were none so I stood up. We need to go back to basics as human beings – you see a vacuum and you fill it. I have great respect for anyone doing that – scientists, doctors, activists, anyone working for humanity – we have to see and treat each other as human beings, acknowledging and respecting who we all are. That’s how I’d like to be treated and I think it’s how I’ve lived my life. Everything I do comes from that place.